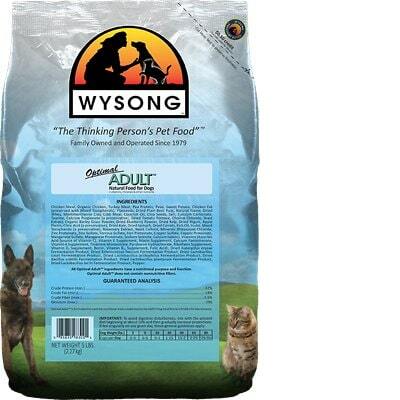 Wysong Optimal Adult is a mid-priced dog food with average quality. This product has 2 controversial ingredients including an artificial preservative. It has well-balanced amounts of protein, fat and carbs with excellent meat and fat quality overall. Wysong has a below-average number of recalls compared to other dog food brands but was not very transparent when answering our questions. Chicken Meal, Organic Chicken, Turkey Meal, Pea Protein, Peas, Sweet Potato, Chicken Fat (preserved with Mixed Tocopherols), Flaxseeds, Dried Plain Beet Pulp, Natural Flavor, Dried Whey, Montmorillonite Clay, Crab Meal, Coconut Oil, Chia Seeds, Salt, Calcium Carbonate, Taurine, Calcium Propionate (a preservative), Dried Tomato Pomace, Choline Chloride, Yeast Extract, Organic Barley Grass Powder, Dried Blueberry Powder, Dried Kelp, Dried Yogurt, Apple Pectin, Citric Acid (a preservative), Dried Kale, Dried Spinach, Dried Carrots, Fish Oil, Inulin, Mixed Tocopherols (a preservative), Rosemary Extract, Yeast Culture, Minerals (Potassium Chloride, Zinc Proteinate, Zinc Sulfate, Ferrous Sulfate, Iron Proteinate, Copper sulfate, Copper Proteinate, Manganese Sulfate, Manganese Proteinate, Sodium Selenite, Calcium Iodate), Vitamins (Ascorbic Acid [source of Vitamin C], Vitamin E Supplement, Niacin Supplement, Calcium Pantothenate, Vitamin A Supplement, Thiamine Mononitrate, Pyridoxine Hydrochloride, Riboflavin Supplement, Vitamin D3 Supplement, Biotin, Vitamin B12 Supplement, Folic Acid), Dried Aspergillus Oryzae Fermentation Product, Dried Enterococcus Faecium Fermentation Product, Dried Lactobacillus Casei Fermentation Product, Dried Lactobacillus acidophilus Fermentation Product, Dried Bacillus Subtilis Fermentation Product, Dried Lactobacillus Plantarum Fermentation Product, Dried Lactobacillus Lactis Fermentation Product, Pepper. The average dog food we reviewed has 39 total ingredients, with 1 controversial ingredient. Wysong Optimal Adult Dry Dog Food has 2 controversial ingredients, explained further down below. Organic chicken is generally a healthy dog food ingredient. It provides nutrients like protein, fat, B vitamins, selenium and choline. Organic dog food ingredients are free of antibiotics, synthetic hormones, pesticides, chemical fertilizers and artificial preservatives. They are also not allowed to be genetically modified. Calcium Propionate is an artificial preservative that helps to prevent mold in dog food. Chronic exposure has been linked to headaches as well as behavior changes in children that include irritability, restlessness, inattention and sleep disturbances. Wysong Optimal Adult is made in the USA. this typically leads to higher quality because of safety standards that are enforced in the United States. This product includes Chicken Meal, Organic Chicken, Turkey Meal, Chicken Fat, Crab Meal, and Coconut Oil. These are the major protein and fat sources, so it’s great to see that all of them show clearly which animals and plant they come from. However, the included Fish Oil is less transparent. This product contains Calcium Propionate, a controversial artificial preservative. We have described Calcium Propionate above, but one more important point: It’s good to know that ‍not all artificial preservatives are bad. That’s because they serve an important purpose, which is to prevent food from spoiling. However, we consider 11 artificial preservatives controversial because of their potential link to cancer and other serious health conditions. Wysong Optimal Adult Dry Dog Food includes no artificial colors at all. That’s what you want to see, great! While it falls short on preservatives, this food does well when it comes to artificial flavors. In other words, it has none. Wysong has had no dog food recalls in recent years, excellent. Unfortunately, due to the volume of inquiries, and varying, ever-expanding points of view on what constitutes quality pet foods and sound pet nutrition, we do not have the time or resources to specifically address and satisfy all perspectives. What we’d offer is the fact that Wysong foods have been fed to tens of thousands of pets over the past 40 years (since 1979) with tremendous health results. Our foods and (equally important) Dr. Wysong’s nutritional/feeding philosophy have had an overwhelmingly, inarguably positive impact. We are not a new organization with something to prove. In an industry filled with nonsense, and “johnny-come-lately” profit-oriented types, our long track record of actually advancing pet health and nutritional innovation speaks for itself. We engage in little to no marketing, and have grown almost entirely by word of mouth thanks to our customer base promoting their positive experiences. Our small family organization has withstood numerous challenges from big corporate entities and industry participants intent on stymieing real innovation and truthful health messaging. Throughout our history we’ve originated many meaningful pet food developments and trends. Examples include: Fresh meats in extruded “kibble” diets, probiotic and enzyme inclusion in processed pet foods, Starch Free™ kibble diets, freezedried raw diets, various targeted pet supplements, an emphasis on high meat (protein & fat) content, promotion of food variety & rotation and the ills of the “100% Complete and Balanced Pet Food” claim, and more. We would appreciate you spending time exploring www.Wysong.net and our associated websites. If you have not already, please sign up for our “100 Pet Health Truths™” program at www.WysongPetHealth.net. The answers to almost all inquiries that we receive can be found by exploring these resources. Thank you again for your interest. Whether you choose Wysong foods or not, please carefully consider our information and messaging. Advancing pet health through multiple channels was our goal when founded, and remains our preeminent goal to this day – more so than just selling Wysong foods. If you’re a critical thinker, chances are your perspective on what’s truly important in pet health and nutrition will come to be aligned with ours. We wish you and yours the very best of health.